A foam gasketing tape designed specifically for loudspeakers! This specially designed foam tape is excellent for making an airtight seal around drivers, terminals, handles, horn lenses, or any other item that needs installed in your cabinet! Speaker Gasketing Tape 3mm x 10mm Overview Finally! 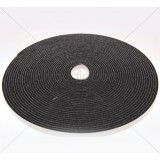 A foam gasketing tape designed specificall..
Speaker Gasketing Tape 3mm x 12mm Overview: Finally! A foam gasketing tape designed specifical..